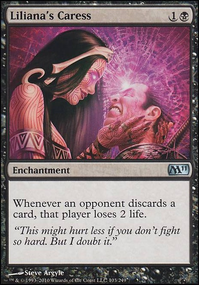 Can i activate Sadistic Hypnotist as an instant with Leyline of Anticipation? 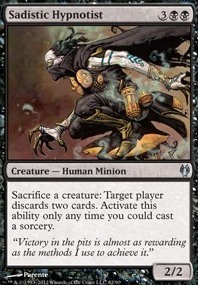 Sacrifice a creature: Target player discards two cards. Play this ability only any time you could play a sorcery. 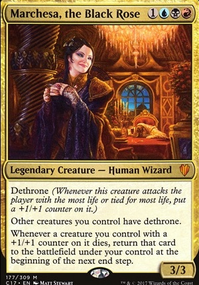 Firstly, I like the deck, but I do see some problems with the moving parts, and for that I'm here to help! Butcher of Malakir has a really nice effect, but the mana cost is too much for the effect. 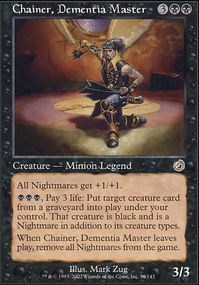 I would recommend a different effect here, something like Sadistic Hypnotist or Carrion Feeder would fit well, being free sac outlets and all. 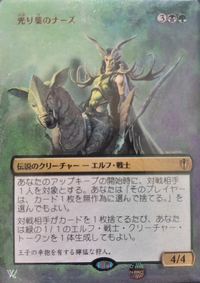 I also agree with everything hkhssweiss said and suggested, but I did want to focus out Butcher because I think there's rarely a place for it in any deck. 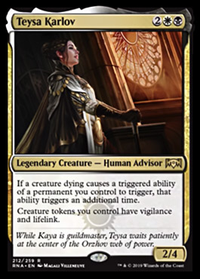 Yahenni, Undying Partisan , Sadistic Hypnotist , Ashnod's Altar , Phyrexian Altar and Altar of Dementia are great cards to have in the deck. Very useful to have free sac outlets in the deck.